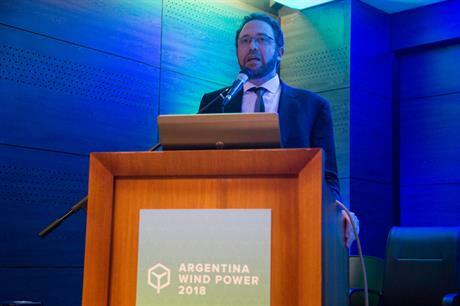 Projects of between 0.5MW and 10MW will be eligible to compete for a total capacity for 400MW in the new tender round, which will begin in October, under-secretary of renewable energy, Sebastian Kind announced at the Argentina Wind Power 2018 conference. There will be 350MW available for wind and solar PV, 25MW for biomass, 10MW for small hydroelectric utilities, 10MW for biogas and 5MW for biogas for landfill, Kind said. The new capacity will be connected in medium-voltage networks of 13.2kV, 33kV and 66kV. Ben Backwell, the new CEO of the Global Wind Energy Council (GWEC), which had organised the conference, said: "This announcement provides a boost for the wind industry in Argentina and it’s a clear signal of ongoing support for the future." Specifications of the bidding round will be announced in October, and bids will be submitted in March 2019 before contracts are awarded and signed by July of next year, Argentina’s energy and mines ministry announced. Power purchase agreements (PPAs) will be signed with the country’s electricity wholesale market management company (Cammesa), and developers must also sign an "adhesion agreement" with the Renewable Fund Guarantee Project for Argentina (Foder) to guarantee invoicing for three months, the ministry added. It also stated that a maximum quota of 20MW will apply per province, except for Buenos Aires — home to the capital city of the same name — where it will be 60MW. Expansions of existing facilities are not allowed in this round, the ministry added. Contracts were awarded for 12 wind farms in Argentina’s latest Renovar tender, with an average tariff of $40.27/MWh, down from $53.34/MWh in the previous round.